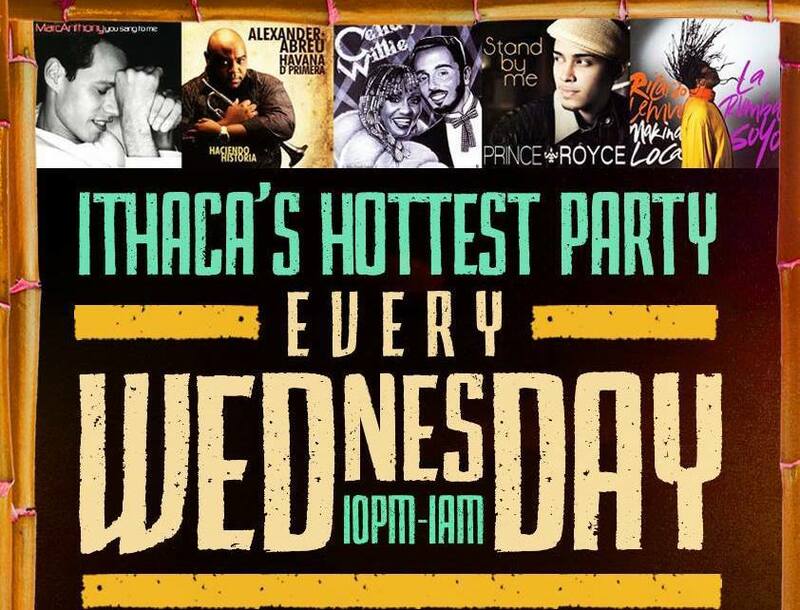 Join an awesome dance community every Wednesday at Ithaca’s longest running Salsa & Latin music event and weekly dance party, now in its 6th year. 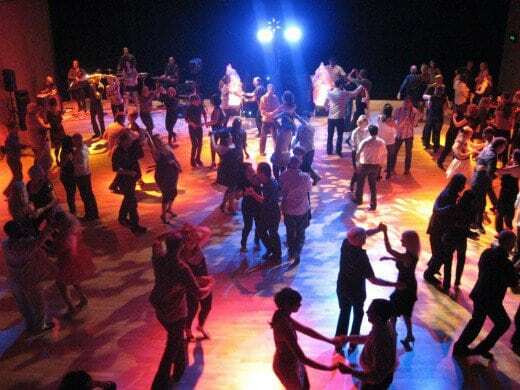 Arrive early, at 10pm, for introductory Salsa, Bachata and Latin dance lessons, including with guest instructors. Dance til 1am to the hottest releases of Salsa-Son-Timba, Bachata, Merengue, Cha Cha Cha, Cumbia, Reggaeton y más… ¡más Salsa! Resident DJs Michael Luis and Luis Vivanco, plus guest DJs, accept requests. Admission is 18+. Gov ID with Age & Photo required. See you on the dance floor… ¡Hasta la Rumba! BUS: Take 92 or 93 TCAT at Schwartz Center in Collegetown all night to AGAVA. Last 93 departs AGAVA at 12:50 am. TAXI: 607.277.777. Discount for multiple passengers. UBER & LYFT: Now serving Ithaca and upstate New York. Download and use. PARKING: in front and in back of Agava. Overflow parking in the lot behind and to the left of Agava. 10-10:30PM Dance Lesson and Guest Workshops. 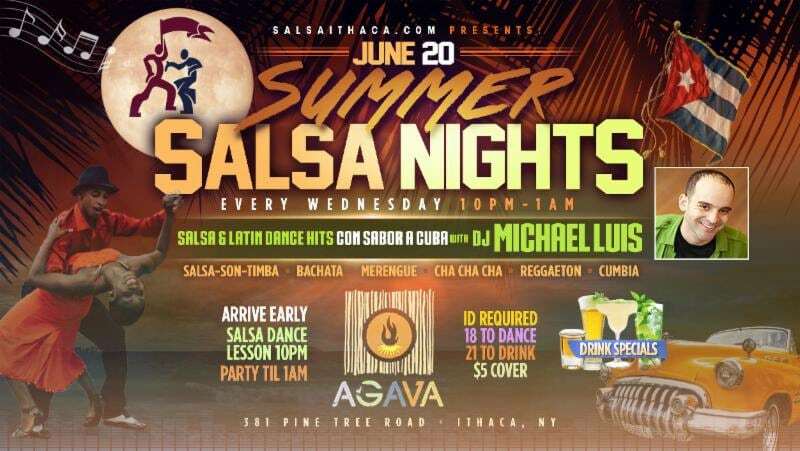 Dance Party til 1am with DJs Michael Luis and Luis Vivanco: Salsa-Son-Timba, Bachata, Merengue, Cha Cha Cha and Reggaeton. Drink Specials, Wine, Beer, and Cocktails. 18+ Admission. ID Required for consumption and admission. $5 cover. Every Wednesday: $6 Agava Margaritas and $4 Dealer’s Choice ‘Top Shelf’ Tequila Shots. 1st Wednesday of Month: Free Margarita or Mojito if your birthday is any day that month. Please support restaurant workers, small business and the dance community by tipping $1 to $2 per drink.